It’s that time of year again! We all want to be outdoors and cooking food on the grill. I adore hot dogs, and these yummy Lightlife hot dogs are super delicious, high in protein, low in fat and salt (comparatively)… and vegan! Are you ready for this awesomeness? Start your grill and make some of these today! Of course you can use a stove top grill pan if you don’t have a grill or are just hungry and in a hurry to eat. Heat a teaspoon of olive oil in a skillet. Once hot, add the chopped kimchi and garlic. Saute for a few minutes, or until the garlic is golden and fragrant. Add the sweet chili sauce and stir until heated through. Cover, remove from heat, and set aside. Toast your buns, and spread a little vegan butter or mayonnaise on them (if you wish.) 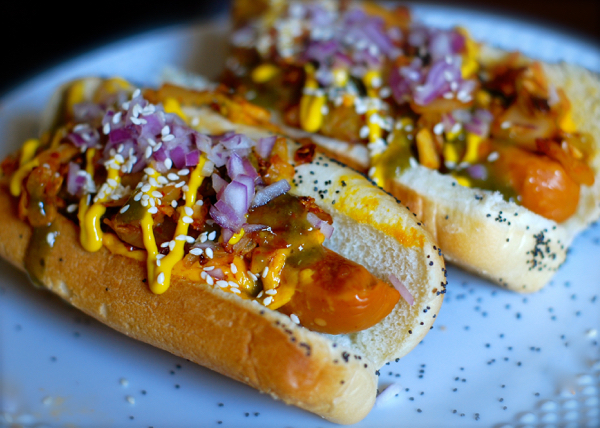 Top with shredded cheddar, the grilled hot dogs, the kimchi mixture, onion, mustard, and sesame seeds. Serve immediately.